The Moto Z3 Play along with the Battery Mod will be sold for BRL 2299 in Brazil and will reach the global markets in coming weeks. Motorola has launched the new Moto Z3 Play in Brazil. The newly unveiled phone comes a year after the Moto Z2 release and is built around the Moto Mods concept of the flagship Z series. The phone comes with some changes in both design and hardware as well. The Z3 Play features a thin aluminium frame and Gorilla Glass 3 panels. The new Moto Z3 Play comes with thinner bezels and flaunts a 6.01-inch Super AMOLED display with a resolution of (1080 x 2160 pixels) with an aspect ratio 18:9. The phone is powered by Qualcomm Snapdragon 636 octa-core SoC coupled with 4GB RAM. The Moto Z3 Play has two internal storage options - 32GB and 64GB - which can be expanded via microSD card up to 2TB. The smartphone runs Android 8.1 Oreo OS and has a 3,000mAh battery. It supports TurboPower 15W charging and also comes with a USB Type-C port. The Moto Z3 Play comes with a rear dual camera setup - features a 12-megapixel sensor with an aperture of f/1.7 and a 5-megapixel depth measurement sensor which will enable users to take bokeh pictures. The phone also comes with dual-pixel autofocus and dual-tone LED flash. The Moto Z3 Play has an 8-megapixel front camera with f/2.0 aperture and screen flash. The Moto Z3 Play which runs on Android Oreo comes with all Moto perks - Moto Display, Actions, Camera and so on. The phone also comes with the Moto Voice update which enables features like handling calls and messages through apps, ability to call Uber etc. The latest version of the Moto Voice offers a lot of features to its users - Calls and Messaging (Android Messages, Facebook Messenger, Whatsapp), flights, Uber, games (for US, Canadian, UK, Indian and Australian English), support for over 70 apps, Moto Insta-Sharing Projector voice control, bug fixes, Natural language support for phone settings and a vast cloud knowledge base, and support on Moto Z3 play, G6 and G6 Plus." 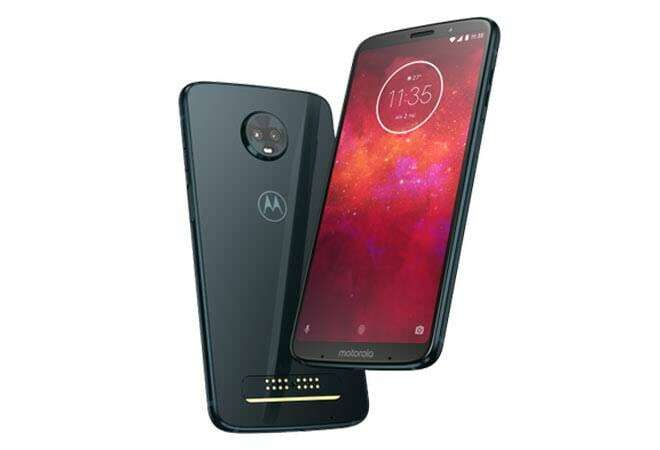 The Moto Z3 Play will come at a price of BRL 2299 (approximately Rs 40,000). The company is yet to announce more pricing and availability details. The Moto Z3 Play will reach the markets worldwide in the next few weeks.